New Jalpaiguri – Howrah Shatabdi Express become the 1st train of NF Railway to be upgraded under project Swarna of Ministry of Railways. To improve passenger experience, Ministry of Railways decided to upgrade Premium Rajdhani and Shatabdi trains under “Project Swarn”. 14 Rajdhani trains & 15 Shatabdi trains have been selected in the first phase under this project. While the 12313 New Delhi – Sealdah Rajdhani Express became the first Rajdhani Express to be upgraded under “Project Swarn” on 29th November, 2017; all the Shatabdi Express trains in N.F.Railway are also covered under first phase of this project. To undertake this programme, Ministry of Railways had formed nine teams of two officers each from Railway board to monitor the progress of work under each dimension of Project Swarna. 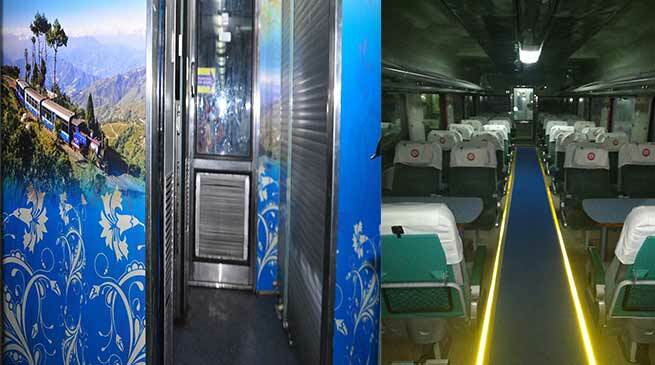 The Shatabdi Express train (12041/12042) running between New Jalpaiguri and Howrah has already been upgraded under Project Swarna with improved features. 12085 / 12086 Guwahati – Dibrugarh Shatabdi Express & 12087 / 12088 Guwahati – Naharlagun Shatabdi Express trains will be modified with upgraded features shortly. The expenditure involved is about Rs. 2 lakhs per coach. Complete interior painting to an aesthetic International colour scheme and LED lighting to improve illumination. Better hygiene by providing “auto janitor” system in toilets. Health faucets, stainless steel wash basins improved soap dispenser and better quality dustbins, carefully chosen locations for ergonomic convenience. Night signage for easy identifications of berth nos for enroute entraining passengers. New design magazine bags with extra pocket for mobile for fitting life style. Vinyl wrapping of toilet doors for improved aesthetics. Polished commodes and basins to make them odour free in every trip.